Dr. Paul Olszynski wants to incorporate POCUS into the medical curriculum in the College of Medicine. While the public has seen the size of cell phones shrink from their Zack Morris ‘brick’ days in the 1990’s, medical professionals have witnessed a similar ‘miniaturization’ of the equipment used in ultrasound imaging. 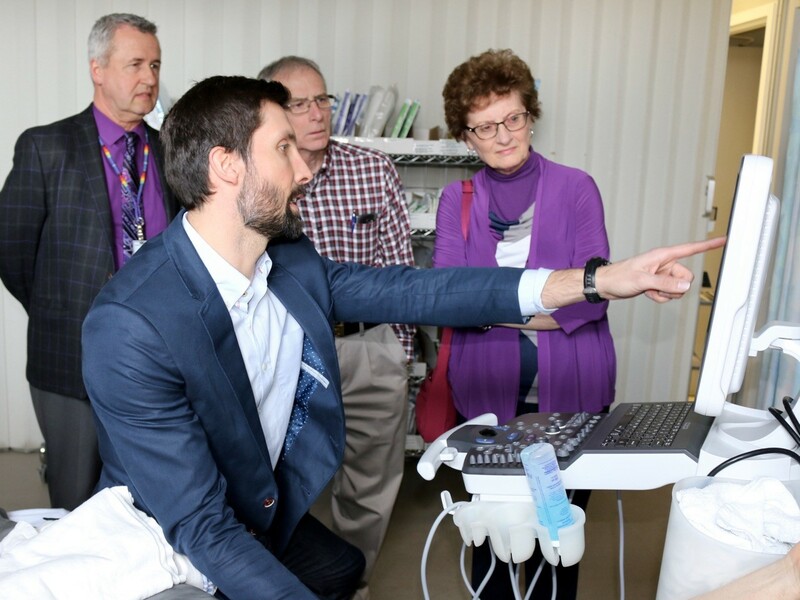 For Dr. Paul Olszynski, the smaller Point of Care Ultrasound (POCUS) machines represent one of those improvements that can make diagnosis easier for emergency doctors, and less stressful and time-consuming for patients. "POCUS is defined as an ultrasound being done by the clinician right at the bedside," Olszynski explained. "It is usually very focused—often answering a binary question or two rather than being comprehensive like the scans done by our colleagues in Medical Imaging. "So it means knowing tremendously more about the patient at the bedside." It's a change that Olszynski said has taken time in that the technology needed to first become more available in terms of size and ease of use, while at the same time required doctors to start thinking about a new way of applying the tool. "Right now you can have machines much more powerful than even the biggest machines from 20-30 years ago," Olszynski continued. "You now have those in the size of a laptop—so when you have that kind of power, with that kind of image resolution, it really helps advance the field." POCUS has enabled doctors to recognize injuries and illnesses ranging from bleeding in the abdomen from trauma, to gallstones, kidney obstruction, and even acute heart failure right at the bedside. And using POCUS to identify these problems in the emergency room has led to an ever-expanding list of uses for the tool.